Fear of answering the door is a lot more common than I thought. Perhaps the word “fear” is a little exaggerated in most cases. For me, that unexpected knock sends a shot of adrenaline right through me. I usually hit the floor, duck, or some other wildly dramatic reaction if there’s a surprise visitor. There’s been more than one occasion where the UPS delivery person walks past my window only to see me stare back like a deer in headlights. Fear of answering the door happens for a lot of reasons. I think it’s a quite justified fear. You hear about fake service workers scamming people to get into homes all of the time. Once they get in the door, it’s a home invasion where anything can happen. This is a double-edged paranoia, though. Some criminals knock on the front door to see if anyone is home. If no one answers, they creep around to the back and break in. So, there’s also fear of not answering the door. 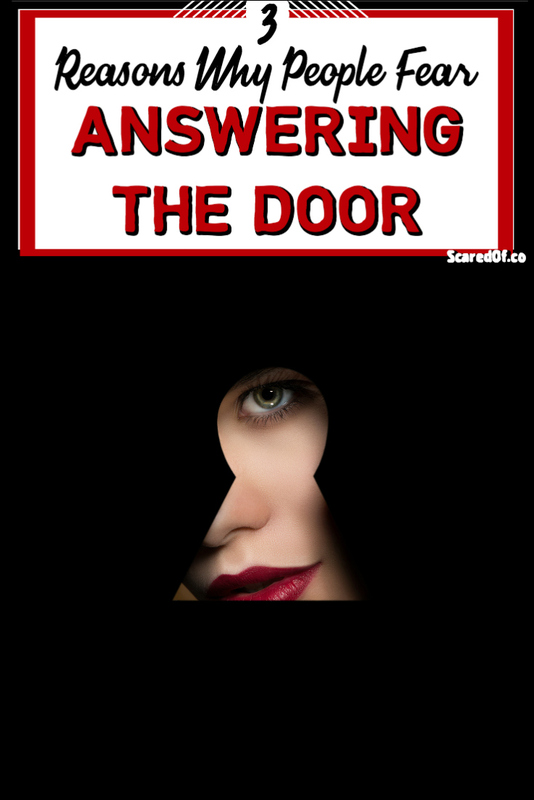 So, what are some reasons we get nervous to answer the door and how can we make ourselves feel safer? Obviously, the scenario I stated above is the biggest concern in most cases. If the person knocking means you harm, clearly, we don’t want to remove that barrier between us. Criminals are bold. They don’t seem to care about daylight, busy streets, or even dogs. I recommend installing a peephole with a camera, or a video doorbell. There are cameras that will snap a picture if there’s any movement in front of your door. The video doorbell allows you to see who’s there before you choose to answer. Let them know, too. Put a sign up that lets them know they are on camera. If they know you have a snapshot of their face stored, it should deter them from whatever evil they had in mind. People who know me know not to “just stop by.” In this day and age when even most 8-year-olds have cell phones, there’s no need to not call first. Of course, every house is different, but if you do a tuck and roll maneuver every time someone knocks, don’t be ashamed to tell your loved ones. Tell friends and family you prefer calls first. Put up a sign to make it crystal clear how you feel about knocking on the door. Give clear instructions for mail and deliveries, so they don’t feel the need to let you know a package has arrived. If you struggle already with socializing, the last thing you want is to handle a solicitor. Honestly, I cannot believe people still try to sell door-to-door. I am all for ambition, but I think the hustle energy needs to be spent elsewhere. Door-to-door sales need to retire. Even if people don’t have a fear of answering the door, there are sleeping babies, people who work nights, and crazy dogs to take into consideration. READ NEXT: 3 Reasons to Fear Leaving Pets Home Alone! Again, hang a sign. Simple “no soliciting” signs seem to be invisible. Get something clever that they won’t miss. Also, call your village. In a lot of cases, a permit is required to solicit in the village. If your town has a Facebook group, post in there, too. We have one where people will report if the street meat guy is out at it again and the mayor shuts that nonsense down quickly. If you have a fear of answering the door, let me know why and what you do to help your situation. This is me through and through. I love this article. It is well written, humorous and I enjoyed reading it. It made some very good points. Very well written and informative article. Thank you!!! Sorry you can relate, but we sure aren’t alone! Scared Of is a participant in the Amazon Services LLC Associates Program, an affiliate advertising program designed to provide a means for sites to earn advertising fees by advertising and linking to amazon.com. Some blogs posts include Royalty Free Images from Can Stock Photo.